The following article is the second in a series of three updates authored by Barnaby Hone where he explores the possible impact of the Criminal Finances Act 2017. 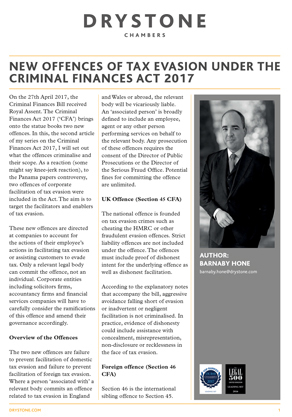 This article deals with two new offences: failure to prevent facilitation of domestic tax evasion and failure to prevent facilitation of foreign tax evasion. Barnaby provides an overview of the new offences and provides some tips for possible defence strategy. He concludes with a timely reminder of the need for corporate bodies, particularly accountants, financial advisers and solicitors to take immediate steps and put in place training and prevention procedures or they may fall foul of the new offences. Barnaby recently returned from training prosecutors and judges from eight countries of the Horn of Africa in Anti-Money Laundering and Mutual Legal Assistance. Barnaby was selected as an expert to carry this training due to his expertise in International Financial Crime and POCA work. Click here to be re-directed to Barnaby’s profile.